If ever there was the proverbial game of two halves then this was it. Down two nil at the break and seemingly down and out Vale staged a remarkable second half recovery to go on and take all three points. The large crowd, boosted in numbers by the cancellation of the Dumbarton match, were quite rightly shaking their heads at the break such was the level of performance from Hugh Hamill's men. However the change in fortunes was dramatic to say the least with Vale thwarted on several occasions by the athleticism of the "Rock" keeper before they grabbed a late winning double that rekindled the slim hope of promotion. Vale were unchanged for the third game in a row with comeback men Dougie Wilson and Tom Fox on the bench, both David Rogers and Scott McKernan were out through suspension. Having recorded a hard fought three goal win at Provanmill against the "Rock" barely a month ago Vale started this match on the impressive Millburn pitch in a very commanding manner. For a quarter of an hour Vale knocked the ball about stretching a rather cumbersome visiting side. However the early pressure came to nothing and as happens so often in these circumstances the opposition got a right lift and turned the tables on Vale. After 17 minutes the home side got caught playing offside and this allowed Docherty a free run in on goal where he drew Maclaurin but the striker passed the ball forward to Reilly who had strayed further forward and although he found the net his effort was disallowed. After surviving this scare one would have thought that lessons would have been learned, it wasn't to be and after 23 minutes Donald put the visitors ahead from the tightest of angles after Maclaurin did well to stop his initial effort although the Vale keeper has every right to be asking where the back up was. If that was bad then the loss of a second goal was even worse for a side with the best defensive record in the league. After 33 minutes Young was given all the time in the world on the left flank and his cross was well controlled by the burly Docherty who expertly chested the ball down before firing a powerful volley high into the net from 12 yards. Vale came on for the second period with the words of manager Hugh Hamill ringing in their ears. They started with Dougie Wilson returning after the serious injury picked up in October replacing McKenzie and with Brian Wardle pushed further forward to play alongside him. This change saw both Ward and David Meechan drop slightly deeper. The pace and trickery of the substitute began to cause a few problems and Vale eventually pulled a goal back after Brown's cross from the left fell kindly to Wilson around the edge of the area and he volleyed home an unstoppable shot into the roof of the net to give Vale a lifeline with 23 minutes left. Any hope Vale had should have been extinguished 8 minutes later when Daly got on the end of a long throw but his header from close range flew over the bar as Vale breathed a huge sigh of relief. Vale regained their momentum and mounted a series of attacks on the "Rock" goal but they seemed destined not to score as David Meechan hit the bar and keeper McLaren produced incredible stops from volleyed efforts from Wardle and Jim Meechan. However full credit to the home side when they grabbed an equaliser after 81 minutes. Brown swung over a cross from the left and Brian Wardle got in before the keeper to head home from close range. 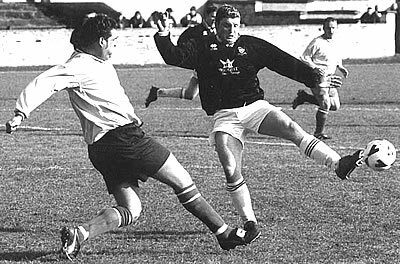 A minute later Vale were in front when David Meechan pounced on a through ball to control the ball on his chest before rounding McLaren to score what was to be the winning goal. With substitutes Hunter and Fox on for Smith and goalscorer Meechan Vale were forced to play out the remaining 4 minutes with 10 men after comeback man Wilson had a recurrence of his troublesome knee injury and was unable to continue. Despite their first half inadequacies all Vale players can take a great deal of credit from their second half showing where man of the match captain Alex Lacy drove his side forward. However some of the comments coming from the terraces were less than inspirational to a side looking for some encouragement. The second half fight back was a more than satisfactory two-fingered salute to those who seem to get some sense of pleasure from the teams misfortune. With only one defeat since October is it really that bad that they seem to constantly abuse the team and the management team, perhaps they should be a little more selective on their choice of Saturday afternoon entertainment. Team: Maclaurin; Lacy, Wardle, J.Meechan, Goodwin; Smith (Hunter), Alan Brown, King; McKenzie (Wilson), Ward, D.Meechan (Fox). Unused subs: Ruane & Barton.